These KING'S 6" Leather Steel Toe Women's Work Boots with Welt Construction are specially designed to be proportional to a woman’s foot. Perfect for long days on the worksite, the welt construction provides greater durability and longer boot life. It also affords better forefoot torsion control and increased stbility on uneven work surfaces. 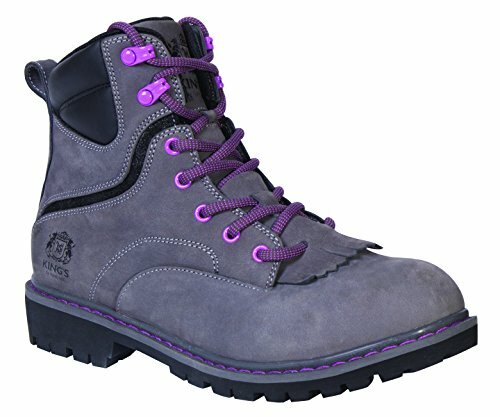 The wide toe box of these women's work boots promotes more comfortable walking and flexing, while the internal heel cup is molded to prevent heel slippage. They also feature a padded ankle collar to help protect against end of day aches and pains. Bright pops of color add a fun finishing touch to these steel toe work boots. If you have any questions about this product by King's, contact us by completing and submitting the form below. If you are looking for a specif part number, please include it with your message.